Quietly sitting at home one night, I received a surprising text message. 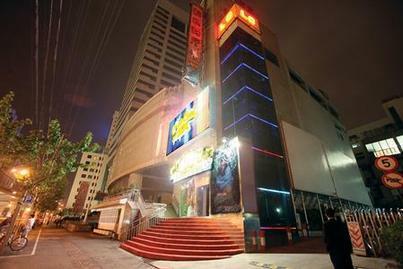 Written in Chinese, the message claimed that the largest gay bar in Asia would "warmly" open that weekend in Shanghai. As a jaded gay, I was quite skeptical of the message and quickly dismissed it, but my dancing feet eventually got the best of me. The gay clubbing scene in Shanghai is not in the best of shape. Club Deep closed a long time ago. PinkHome's troubles continue to affect its reputation. As one of my gays told me, "PinkHome is dead." Nowadays, most of the regular clubbers end up at Shanghai Studio, complaining that "there's no where else to go." In fact, many gays have resolved themselves to, gasp, going to straight bars in order to get their dance on, with MAO and M Seven being the most popular clubbing destinations. After a fun night of ogling and dancing, I was quite optimistic about the future of the club. With Club Deep out of the picture and PinkHome quickly fading into obscurity, Club LC could easily fill the void. In addition to dancing and drinking, the club also features nightly performances starring ridiculously skinny boys that need to eat a hamburger--or four. While the performances aren't worth writing home about, it's certainly better than some sad drag queen shows I've seen. "Sure, it's big, but when there's no one there, it looks completely empty," said one club goer that I spoke to. I would have to agree with that statement. Popularity is very important in the Shanghai gay community. For example, if it looks like no one is dancing and having a good time, they all head to the exits as if there's a fire. With its large space, eventually the crowd will probably dwindle away and Club LC will fade just like the others. While the pessimist in me believes that, for the sake of Shanghai's gay club scene, I really hope I'm wrong.